ALBANY, New York, December 13, 2010 (ENS) – On Saturday, New York Governor David Paterson made New York the first state to place a moratorium on natural gas drilling that uses hydraulic fracturing, or fracking, to release the gas trapped in shale rock. 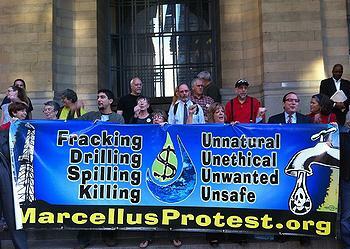 Responding to public concern that fracturing chemicals pumped underground to crack rock seams and increase gas production can contaminate drinking water, the governor issued an Executive Order directing the Department of Environmental Conservation to conduct a comprehensive environmental review of fracking in the Marcellus Shale. The Executive Order requires that high-volume, horizontal hydraulic fracturing would not be permitted until July 1, 2011, at the earliest. One concern is the release of underground naturally occurring radioactive material through the drilling fluids and equipment. The hydraulic fracturing process also uses large quantities of surface water. The governor said the moratorium should allay any fears that high-volume hydraulic fracturing and horizontal drilling under study by the Department of Environmental Conservation will commence without assurances of safety. Environmental and public health groups said the moratorium makes New York the first state to insist on protecting the health and safety of its citizens and drinking water, before allowing drilling to proceed. But they are concerned that Governor Paterson issued this order while simultaneously vetoing a stronger bill passed by overwhelming bipartisan majorities in the New York State Senate and Assembly. The bill would have suspended the issuance of new oil and gas drilling permits through May 15, 2011. All conventional, low-volume, vertical oil and gas wells would have been blocked in addition to high-volume, horizontal hydraulic fracturing wells. The governor said he could not suspend all drilling permits in these tough economic times. “Enacting this legislation would put people out of work – work that is permitted by the Department of Environmental Conservation and causes no demonstrated environmental harm, in order to effectuate a moratorium that is principally symbolic,” Governor Paterson said. “Symbols can have great importance, but particularly in our current terrible economic straits, I cannot agree to put individuals out of work for a symbolic act,” he said. But without the legislation in place, environmental, community and public health organizations say the Executive Order creates a loophole that oil and gas corporations are poised to exploit. Like horizontal wells, vertical wells have been linked to drinking water contamination and other health and environmental dangers across the country. “Gas companies have already threatened to drill vertically into the Marcellus and Utica Shale formations during the moratorium and then convert those wells into horizontal wells as soon as the moratorium sunsets,” a coalition of groups said Saturday. “Unlike the moratorium bill, the Executive Order does not protect against the dangers of all fracking wells, but allows so-called vertical wells – exactly the kind of wells that were responsible for ruining nine square miles of aquifer and poisoning the drinking water of more than a dozen families in Dimock, Pennsylvania, along with many other pollution incidents in Pennsylvania – to move forward. This loophole still leaves New Yorkers at risk and gas corporations are already threatening to exploit it,” the groups said in a joint statement. The groups are hopeful that when incoming governor Andrew Cuomo takes office in January, he will close the loophole. Named for a distinctive outcrop near the village of Marcellus, New York, the Marcellus Shale is a layer of rock that extends 600 miles throughout much of the Appalachian Basin. The shale contains natural gas reserves, estimated in 2008 by Terry Engelder, a Pennsylvania State University geosciences professor, at 363 trillion cubic feet of recoverable resource – enough to supply U.S. consumption for at least 14 years. Its proximity to the high-demand markets along the U.S. East Coast make the Marcellus Shale an attractive target for energy development.